Made by respected worldwide manufacturer Ciba Vision, Focus Dailies Toric have been specially formulated to correct astigmatism, long-sightedness and short sightedness, whilst also giving the wearer all-day hydration and comfort. They provide the same quality of vision as glasses with the convenience of a contact lens. 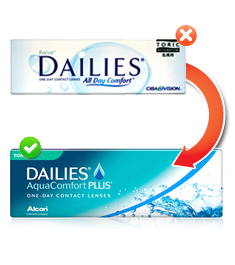 With daily disposables, wearers get the best of both worlds without the time-consuming care routine demanded by monthly contact lenses. Custom engineered, Ciba Vision, Focus Dailies Toric lenses have a two-pronged design which corrects astigmatism efficiently. Each lens has two different powers and features curvatures in differing angles. To do their job properly, this type of lens needs to stay put constantly. Ciba has provided this characteristic in their Focus Dailies Toric contact lenses by adding their patented Lightstream technology. This allows for the lens to be thin without compromising on quality of use or vision. Daily disposables are often associated with flimsiness and dryness. 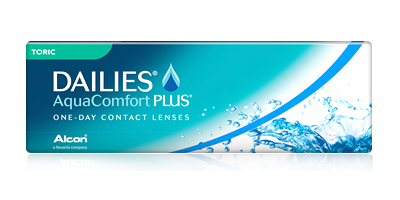 These contact lenses last the day and keep the eye moist constantly, thanks to a blink-activated moisturisation system. Each time you blink moisture is released, which helps to combat dryness, grittiness, and blurriness. Thin but strong and durable, Focus Dailies Toric lenses have a non-ionic surface which reduces protein-build up and makes them easy to handle and apply. They're designed to be instantly forgotten from moment of application to removal. 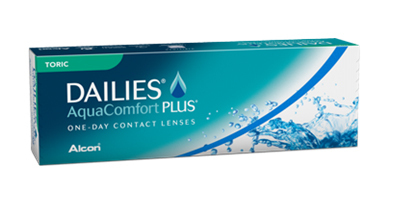 Please contact us on 0330 088 3133 with any enquiries regarding these daily disposable contact lenses and any other products featured on Lensite.co.uk. Place an order for Ciba Vision Focus Dailies Toric lenses with us and get express delivery to your doorstep. 98% of orders are usually despatched on the same day as placement.